This name uses Spanish naming customs: the first or paternal family name is Lafourcade and the second or maternal family name is Silva. María Natalia Lafourcade Silva (Spanish pronunciation: [maˈɾi.a naˈtalja lafouɾˈkaðe ˈsilβa]; born 26 February 1984) is a Mexican pop-rock singer and songwriter who since her debut in 2003 has been one of the most successful singers in the pop rock scene in Latin America. Lafourcade's voice has been categorized as a lyric soprano. Lafourcade was born in Mexico City, Mexico, surrounded by music and art. Her father is the Chilean musician Gastón Lafourcade and her mother is the pianist María del Carmen Silva Contreras. Her uncle is the Chilean writer Enrique Lafourcade, a representative of the so-called "Generation of the 50s". She grew up in Coatepec, Veracruz, Mexico, where she studied music with her mother, María del Carmen Silva Contreras, imitating artists such as Gloria Trevi and Garibaldi. Her mother studied piano with a specialty in musical pedagogy and is the creator of the Macarsi Method for musical training and personal development for children and educators. She adapted and practiced the method with Natalia to help her rehabilitate through music following a head injury from being kicked by a horse. When she was 17, Loris Ceroni gave Lafourcade the opportunity to be in a pop/rock group under his guidance. Lafourcade was hesitant, and Ceroni instead encouraged her to become independent. Lafourcade produced her first LP under the label of Sony Music. It was recorded in Italy and was cowritten with Aureo Baqueiro. Sabo Romo played in 2 songs. Natalia Lafourcade is a mix of pop, rock, bossa-nova and Latin rhythms. It features the songs "Busca Un Problema", "Elefantes", "Te Quiero Dar", "Mírame, Mírate", and her biggest hit, "En El 2000". In 2003, she was nominated for a Latin Grammy in the Best New Artist category for her debut album. She was also the principal contributor to the soundtrack for the Mexican movie Amar te duele and contributed the song "Un Pato" for the movie Temporada de patos. Lafourcade was nominated for Rock New Artist at the 16th Lo Nuestro Awards, losing to fellow Mexican singer Alessandra Rosaldo. In 2011, Lafourcade won the Best New Producer of the Year award in the Indie-O Music Awards, for her work with Carla Morrison's Mientras tu dormías album. In 2005, she released Casa, her second album, but this time as Natalia y La Forquetina, the name of her band. Produced mostly by Café Tacuba's Emmanuel del Real, Casa presents a more mature, rock-oriented sound while retaining pop and bossa-nova influences on a few tracks, such as lead single "Ser Humano" (pop-rock) and its follow-up "Casa" (pop-bossa-nova). Aureo Baqueiro returned to produce the few tracks not produced by del Real. In June 2006, after a tour through Mexico and parts of the U.S., on June 2, Lafourcade announced she would leave La Forquetina to once again work as a solo artist. Natalia y la Forquetina's final show was played on August 18, 2006 in San Luis Potosí. Following the group's break-up, Casa won the Latin Grammy for Best Rock Album by a Duo or Group with Vocal in September. Also in 2006, a documentary about the band, showing the group on the road and their travels, was aired on MTV Tr3s in the fall of 2007. Natalia Lafourcade has also appeared on other songs with various other artists. These include Liquits' "Jardin", Kalimba's "Dia de Suerte", Control Machete's "El Apostador", and Reik's rendition of a Lafourcade song "Amarte Duele". Also she along with her former band have appeared on various compilation disks with previously unreleased tracks such as "Y Todo Para Que" on Intocable's X and on the Tin Tan tribute album, Viva Tin Tan, with the hit "Piel Canela". In 2011, she made "Quisiera Saber", a music video with Los Daniels. More than a year after Natalia departed from La Forquetina, she recorded an instrumental album called The 4 Seasons of Love under Sony BMG label. She also wrote the Lyrics for "Tú y Yo" from Ximena Sariñana's self-titled album. In 2008, she performed on Julieta Venegas' MTV Unplugged album and DVD. In 2009, she released the album Hu Hu Hu, a top 10 album in Mexico. The album was produced by Emmanuel del Real (who produced "Casa" in 2005), Marco Moreno and Ernesto García. It was nominated for Best female Pop Vocal Album at the 2009 Latin Grammy Awards (won by Laura Pausini) and Best Latin Pop album at the 2010 Grammy Awards (won by La Quinta Estación). Club Fonograma also named the album the second best of 2009, and the seventh best of the decade. In 2012, she released a tribute album to Agustín Lara called Mujer Divina. Her next album, Hasta La Raíz, was released in March 2015. "Nunca Es Suficiente" (It's Never Enough), the first single off the album, was released on February 10. The track "Hasta La Raíz" was No. 5 of the Viral 50 Global Spotify Chart and the No. 1 on the Viral 50 México chart. She performed on the NPR Music Tiny Desk series on October 27, 2017. In the first month of its presence on YouTube, it had been viewed more than 1,350,000 times. In 2017, she recorded "Remember Me" as a duet with contemporary R&B singer Miguel for the credits of the movie Coco, and together they also performed the song at the 90th Academy Awards ceremony. ^ "Sopranos, Mezzosopranos y Contraltos en la música popular". taringa.com. Retrieved 30 January 2016. ^ "Ricky Martin, Shakira, Thalía, Ricardo Arjona, Pepe Aguilar Y Vicente Fernández entre las superestrellas nominadas para el Premio lo Nuestro 2004". Univision. Business Wire. January 14, 2004. Retrieved September 27, 2013. ^ "Marc Anthony y Marco Antonio Solís entre los Grandes Ganadores del 'Premio Lo Nuestro a la Música Latina'". Univision (in Spanish). Business Wire. February 27, 2004. Retrieved March 8, 2014. ^ "Club Fonograma's Best Albums of 2009". clubfonograma.com. Archived from the original on 10 June 2015. Retrieved 3 May 2015. ^ "Best of the decade recap". clubfonograma.com. Archived from the original on 23 September 2015. Retrieved 3 May 2015. ^ "Natalia Lafourcade: NPR Music Tiny Desk Concert". October 27, 2017. ^ Emeryville, Calif (January 23, 2018). "Pixar's 'Coco' nominated for 2 Academy Awards". ABC 7 News. Retrieved January 24, 2018. ^ Lynch, Joe (December 7, 2018). "2019 Grammys Nominees: The Complete List". Billboard. Eldridge Industries. Retrieved December 10, 2018. 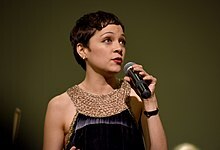 Wikimedia Commons has media related to Natalia Lafourcade. Madrigal, Alex (March 25, 2009). "Encuentra su libertad Natalia Lafourcade experimenta nuevos ritmos en el estudio de grabación". El Universal (in Spanish). Retrieved 28 December 2009. This page was last edited on 30 March 2019, at 03:37 (UTC).